Is Growing a Cannabis Bonsai Tree Possible? In the world of cannabis, production is almost always the main goal. Producing the most cannabis flowers per square foot is the goal of nearly every grower. That point aside, there’s no denying that cannabis is an attractive plant, and many people enjoy it for its unique aesthetic beauty. As an annual plant, however, this beauty is short-lived, and the plant sprouts and grows to maturity before perishing in well under a year. Does this preclude the possibility of growing bonsai cannabis plants for fun and still enjoy the rewards of a harvest? There’s no definitive answer to this question. It could be either yes or no depending on your ultimate goal. Certainly, cannabis would be a poor choice for a traditional bonsai tree project. Traditional bonsai trees are grown for many years and receive regular training and pruning to achieve their classic look and diminutive size. Bonsai trees can be grown indoors using tropical or subtropical species, or outside using deciduous or evergreen trees—which is probably the most classic form of bonsai tree, the variety that many of us know from the first The Karate Kid film. While the venerable Mr. Miyagi would probably have little use for a cannabis bonsai tree, the modern, progressive cannabis grower could have some fun trying his or her hand at accomplishing this goal. Like evergreen bonsai trees, the purpose of a cannabis bonsai plant would be for its small-scale beauty. Let’s take a look at some of the possibilities of short-stature cannabis plants as well as using cannabis for bonsai purposes. Many cannabis growers choose to top their plants to prohibit excessive vertical growth. Vertical space is particularly a concern for cultivators using a closet or grow tent, where space is at a premium. Certain strains lend themselves more to topping than others. Tall and lanky sativas that grow to towering heights must be kept in check in many grow rooms. If a grow employs “sea of green” (SOG) best practices, the plants will usually be indicas or indica-leaning hybrids, and they are never topped. Instead of thwarting vertical growth, the cultivator is striving to grow multiple clones with single colas in a sea of green designed to maximize use of available space. The plants in this type of grow reach extremely similar heights. For a home grower who limits the grow to 12 plants or less, topping is a common practice, especially if there are two or more strains in the grow. Different strains grow to different heights, so manipulating the taller strains to grow shorter by topping will keep heights more consistent. Topping will also promote lateral growth and cause a plant to grow more colas instead of one single, large cola. Topping is a simple process that is done in the vegetative growth stage of a cannabis plant’s life. To top a plant, the grower will cut the main, actively growing tip of the plant (apical meristem). This will cause the plant to fork into two main branches at the top. Topping can be done once or multiple times, each time causing the topped branch to fork. Each time the grower tops a plant, the bushier it will become. While topping will create a shorter plant with multiple branches, it will not resemble a traditional bonsai tree in appearance other than being short. The stout, twisted look will not occur. Another method a cannabis cultivator can use to manipulate the height and appearance of a cannabis plant is bending and training. This practice is accomplished just like it sounds, bending the branches of the plant to grow in a specific direction other than straight up. This will definitely result in a plant with a very different look from a typical cannabis plant. 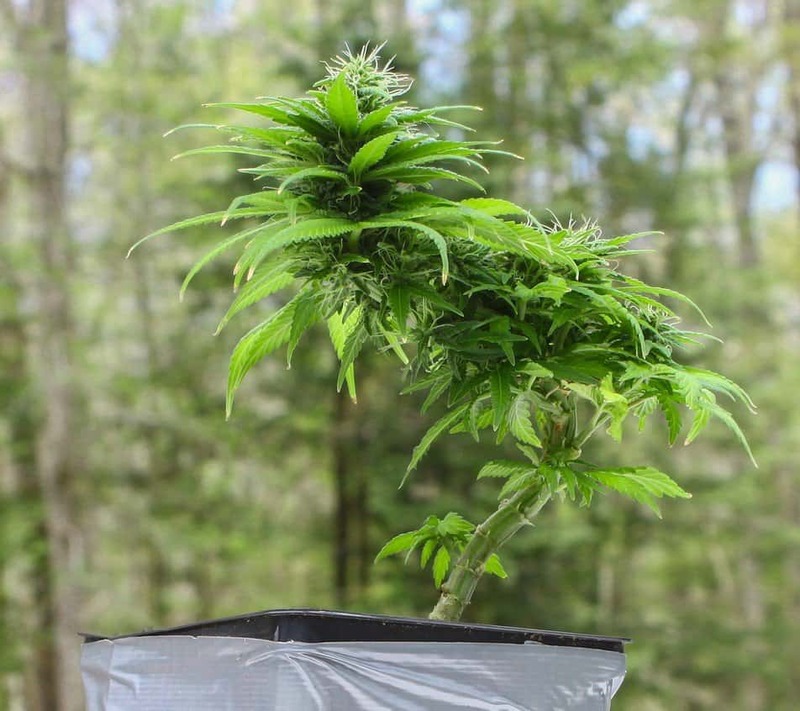 To bend and train, the cultivator will use twine or wire and wood or plastic stakes to bend a growing branch to grow at a 90-degree angle, or even as extreme as nearly 180 degrees, so it’s growing in a downward direction. This will prevent the plant from growing taller. It will grow in an unconventional manner, but the harvest is usually similar to what it would be without bending or training. A more traditional bonsai tree appearance can be accomplished by using a mother plant from which clones are cut. Mother plants are kept in a perpetual state of vegetative growth to accommodate the need for removing multiple cuttings for use as clones. Mother plants can grow for years—unlike the vast majority of cannabis plants that are grown for the purpose of harvesting their flowers for consumption. Older mother plants often take on a gnarled, twisted look. The main trunk of mother plants can grow very thick. Strategic removal of cuttings can manipulate the appearance of these plants to bear a resemblance to a bonsai plant. The main reason why mother plants will not be the best choice for bonsai use is that they are usually kept well out of sight in areas with 18-hour light to encourage continuous vegetative growth. They typically inhabit low-traffic areas of a cultivation setup, so their bonsai charm will probably not be seen by anyone but the grower—and experienced cultivators do not often parade people through their growing spaces. Using conventional methods to create a traditional bonsai tree is possible if the grower realizes that the eventual harvest will be meager at best. With that reality understood, the process can be quite fun and rewarding for its visual appeal. As a quick-growing plant, cannabis will require precise measures to achieve a classic bonsai appearance. The primary materials you will need are a young cannabis plant, twine or wire, a rounded wooden stake with a small diameter, a 2-gallon plastic pot with good drainage, good-quality soil, and a drill. Your pot will have holes at the bottom to promote thorough drainage, but you will use the drill to create several evenly spaced holes a ½ inch below the rim of the pot, so you end up with approximately six holes. Once your plant is securely situated in the pot, you will begin to train it—in a similar way you would train a plant for vertical space limitations in a grow room. Insert the stake at an angle near the base of the plant’s stalk, taking care to not damage the root system. Next, carefully and gently wrap the pliable main stalk of the plant around the stake in the position you want it to grow. Secure the stalk to the stake dowel with wire or twine, and also use the holes at the rim of the pot to secure the lower branches in a low position. The idea with bonsai plants and trees is to keep them low and wide. The manner in which you manipulate the plant to grow and the position in which you secure it will determine the overall shape it will establish. The stalk will soon conform to the position in which you put it, to the point where, later, the stake is no longer necessary. As the plant continues to grow, you will continue to train it by tying the branches down in the shape you wish them to maintain. The twine you use should be tied tight, but not so tight that it damages the plant. To encourage vertical growth, simply loosen the twine. Once the plant is flowering, regular trimming will help create and maintain the desired shape. You will eventually want to showcase the buds rather than the leaves. When it comes time to harvest, the yield will be less than you would accomplish with traditional growing methods—but those plants aren’t as fun to grow, so it’s a tradeoff. Growing cannabis bonsai plants is a fun and rewarding way to take your cannabis cultivation in a different direction. As you continue growing them, you will continue to refine your methods to accomplish your ideal results. Have fun with it, and enjoy the fruits of your labor!